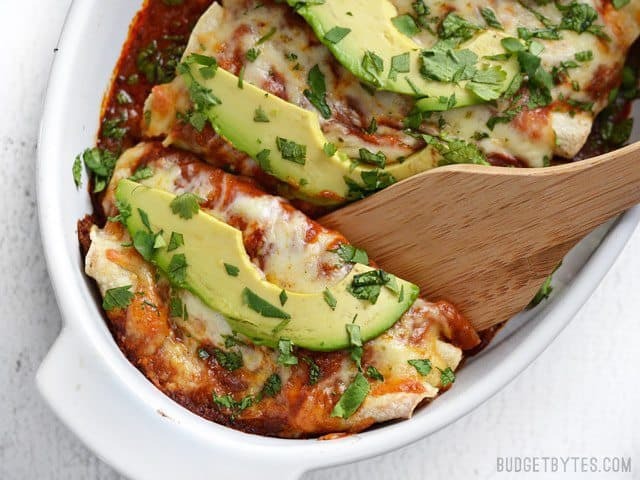 Why am I calling these enchiladas Weeknight Enchiladas? Because they’re basic. 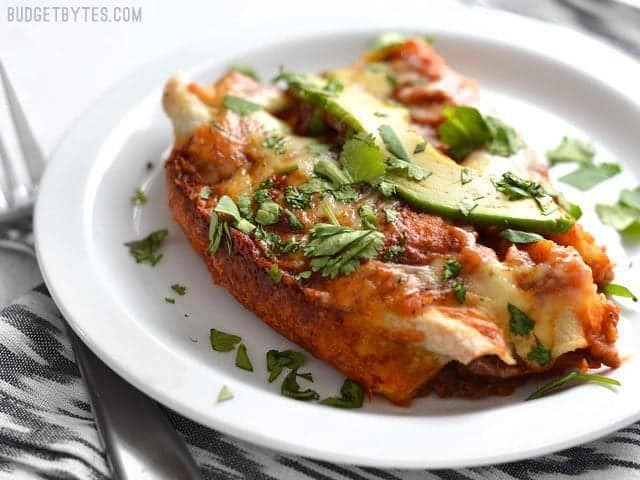 Nothing frilly or fancy, just simple, basic bean and cheese enchiladas. But there are three things that, IMHO, turned these very basic enchiladas into something quite extraordinary. 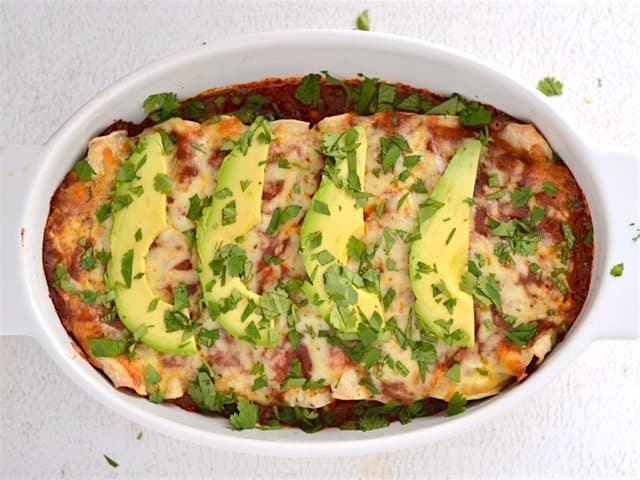 Now, numbers one and two don’t take but a few minutes to complete, and make a huge difference in the end flavor and quality of the enchiladas. Toasting the tortillas in a dry skillet before assembling the enchiladas gives them a nice nutty flavor, makes them stronger, and prevents them from cracking open in the oven. 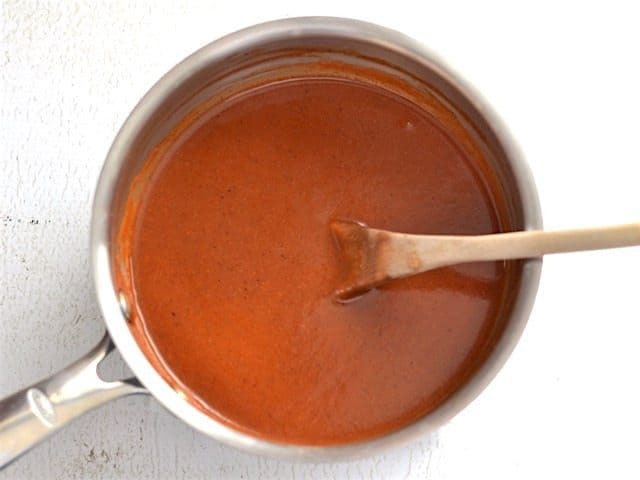 My Easy Red Enchilada Sauce only takes about 5 minutes to make, but makes a world of difference compared to canned sauce. Sure, it’s not full-fledged, dry pepper, from scratch sauce, but it sure tastes like it could be! 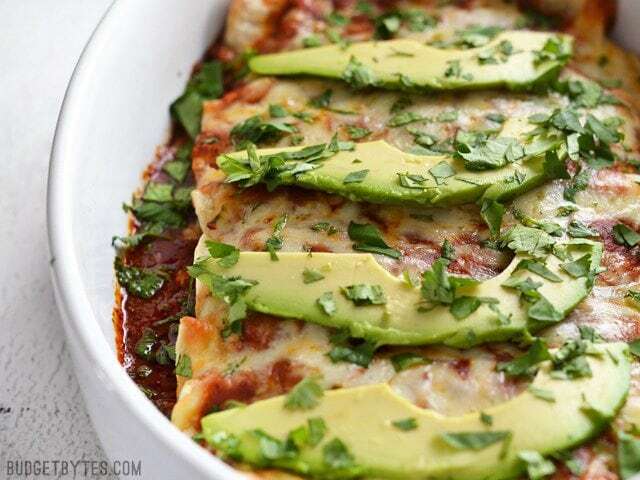 That intense flavor drenches the enchiladas and really takes the dish to the next level. Number three, on the other hand, can be a bit more time consuming. I made my (not) Refried Beans in the slow cooker the day before, but if you don’t have time to do that, you can still doctor up canned refried beans to make sure your enchiladas are top notch. I suggest mincing a clove of garlic, finely dicing a jalapeño, sautéing both in a splash of oil until soft, then adding the beans, some cumin, and maybe even a splash of your favorite hot sauce (Cholula would be nice). That method should only add a few minutes to the process and can be done while making the enchilada sauce or toasting the tortillas. One last tip. 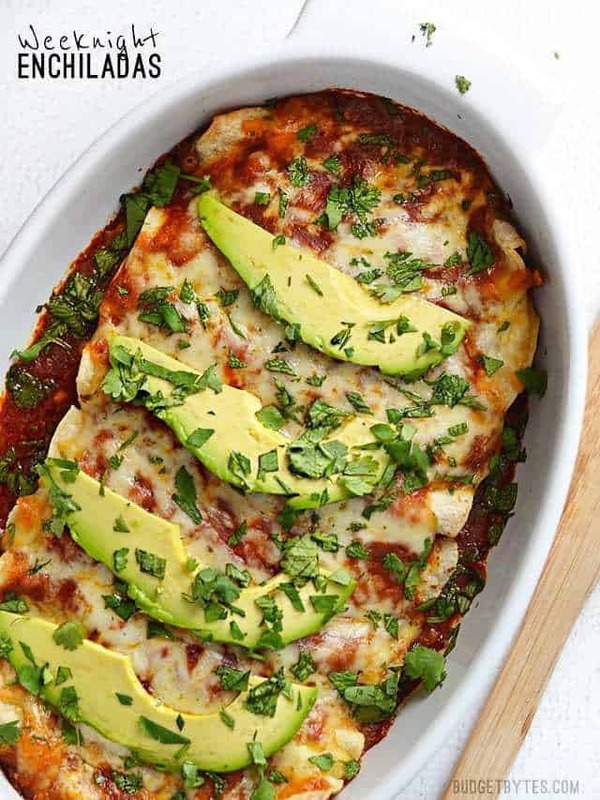 I would have loved to have topped these weeknight enchiladas with Cotija (that crumbly white Mexican cheese), but unfortunately it was really expensive at my local grocery store and I didn’t have time to go scout the local Hispanic grocers. I used pepper jack instead, which is nice and creamy, but cotija would have been really amazing. 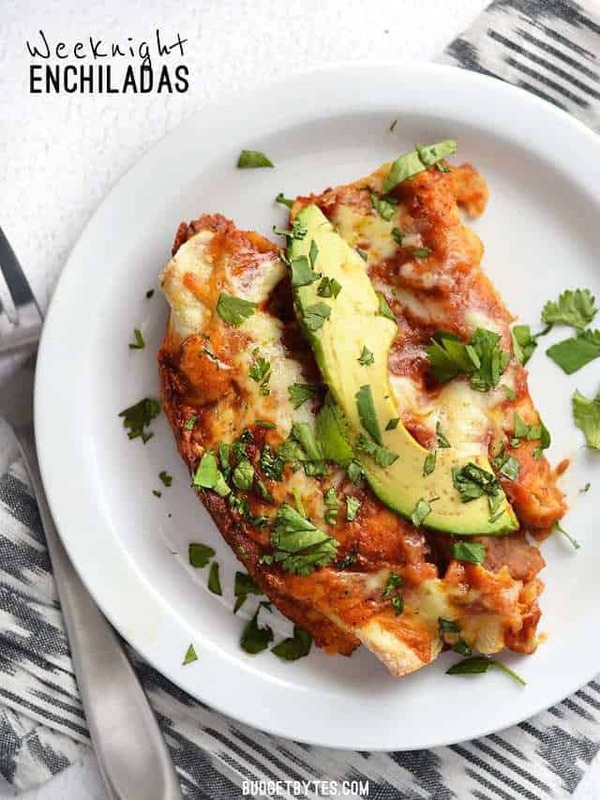 These basic Weeknight Enchiladas are anything but boring. A few important details take their flavor from simple to spectacular. Toast the tortillas in a dry skillet over medium flame until they are just flecked with brown on each side. 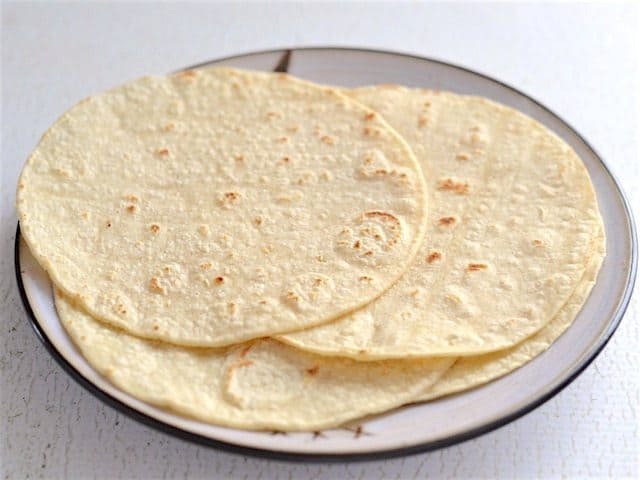 The tortillas should be slightly more firm, but still pliable enough to roll. Stack the tortillas on a clean plate as they come out of the skillet. Prepare a casserole dish by coating with non-stick spray, then spread a layer of enchilada sauce over the bottom (1/2 to 1 cup). Preheat the oven to 350 degrees. Add about 1/4 cup of refried beans to each tortilla, plus a small pinch of shredded cheese. 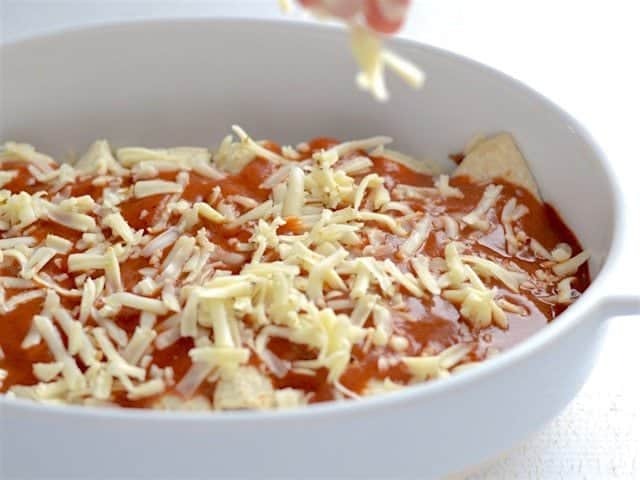 Roll the tortilla tightly around the beans and cheese, then place seam side down in the casserole dish. Continue until all of the tortillas are filled. 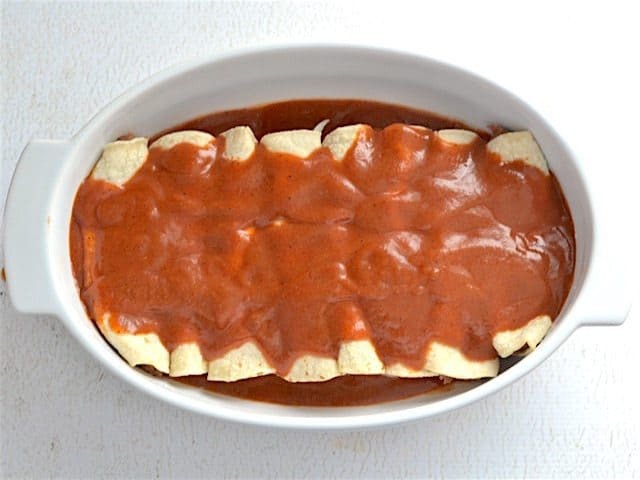 Pour another 1/2 to 1 cup enchilada sauce over the rolled enchiladas in the dish, leaving some of the edges exposed so they can become brown and crispy. 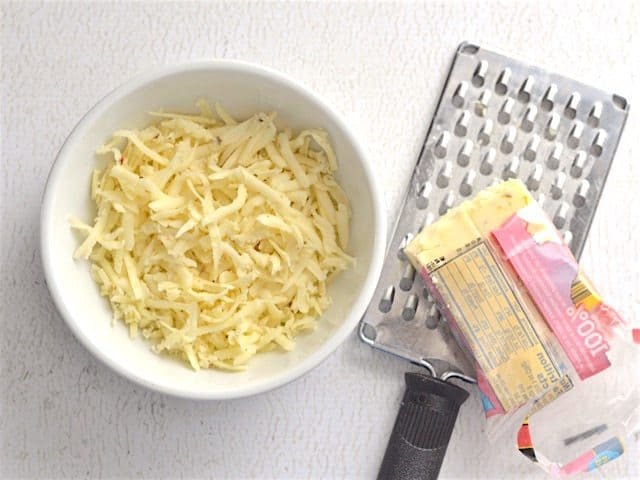 Top with the remaining shredded cheese. Bake the casserole in the oven for 25-30 minutes or until the sauce is thick and bubbly around the edges and the center is heated through. Top with thin slices of avocado and chopped cilantro leaves (or sliced green onions). 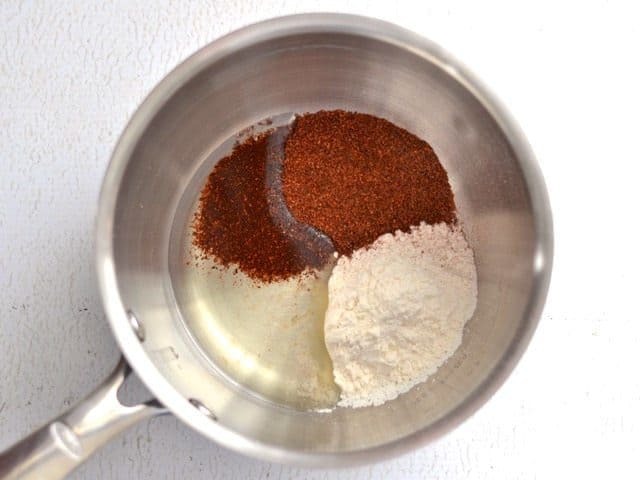 *This is a mild, salt free chili powder blend. Always check the ingredients on the bottle, as some brand contain salt and cayenne pepper. Adjust the seasonings in the sauce as needed. Note: I only baked a half batch for the photos because I lost my large casserole dish. Oops! Combine 2 Tbsp chili powder (mild, salt-free blend), 2 Tbsp all-purpose flour, and 2 Tbsp vegetable or canola oil in a small sauce pot. Let those three ingredients simmer together (stir frequently) for about two minutes. 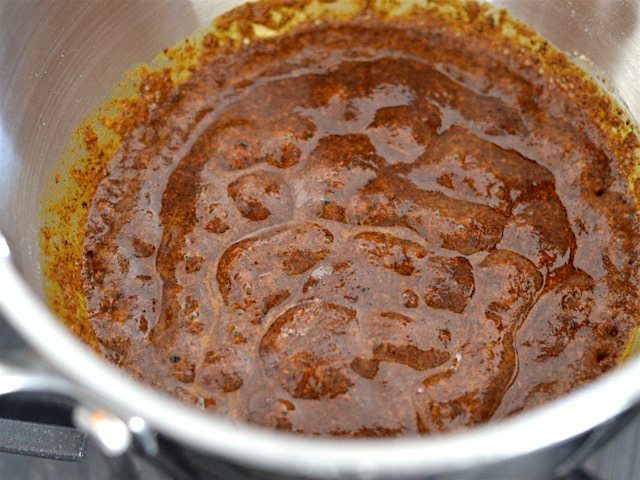 This toasts the spices and flour and creates a roux that will thicken the sauce. Whisk in 2 cups water, 3oz. tomato paste (half of a 6oz. can or about 4 Tbsp), 1/2 tsp cumin, 1/2 tsp garlic powder, and 1/4 tsp cayenne pepper. Allow the pot to come to a simmer, at which point it will thicken. When it’s thick enough to coat a spoon, turn the heat off and add the salt (1/2-3/4 tsp). Set the sauce aside. Toast 16 small corn tortillas in a dry skillet over medium heat until there’s just a hint of brown on each side. This strengthens the tortillas so they don’t fall apart, and also gives them a nice nutty flavor. Just stack them on a clean plate as they come out of the skillet. (I usually do two in a skillet at a time). Shred 8oz. of pepper jack (2 cups). Begin to preheat the oven to 350ºF. 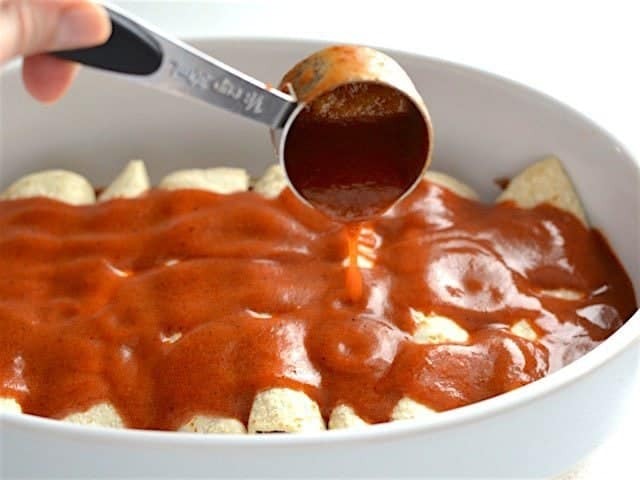 Coat a casserole dish with non-stick spray, then pour a layer of enchilada sauce in the bottom (use about half, leaving half to pour over top). 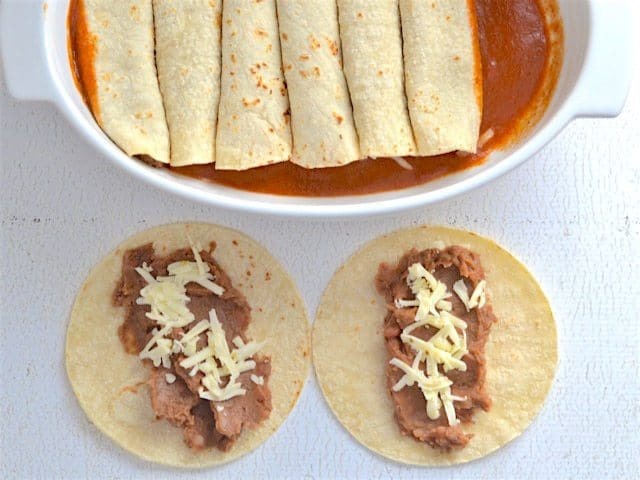 Spread about 1/4 cup refried beans down the center of each tortilla and top with a pinch of shredded cheese (make sure to save about half of the cheese to top the casserole). Roll the tortillas up tightly, then line them up all snug in the casserole dish. Pour the remaining enchilada sauce over top of the rolled enchiladas. I like to leave the edges of my tortillas “unsauced” so they get nice and crispy and lightly browned. More texture and more flavor! 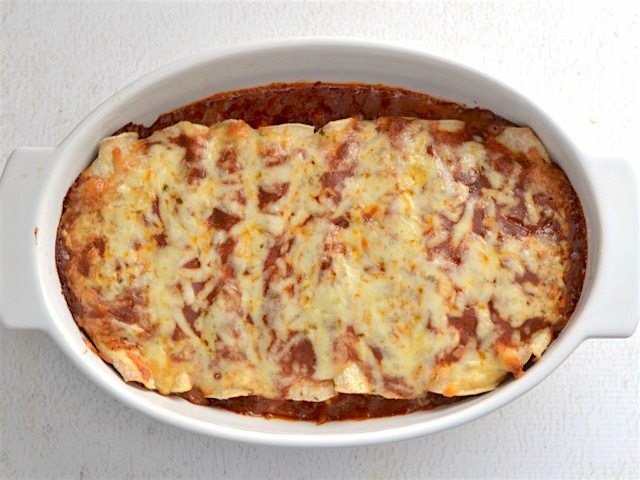 Bake the casserole in the preheated 350ºF oven for 25-30 minutes, or until the enchilada sauce is super thick and bubbly, and the edges of your tortillas are nice and golden brown. Top with thin slices of avocado and chopped cilantro (or green onions). 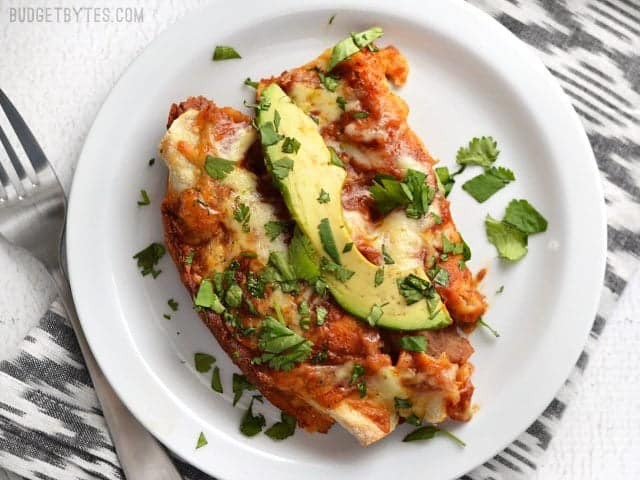 Seriously, these Weeknight Enchiladas make me want every day to be a weekday. SO GOOD. Who says basic equals boring? 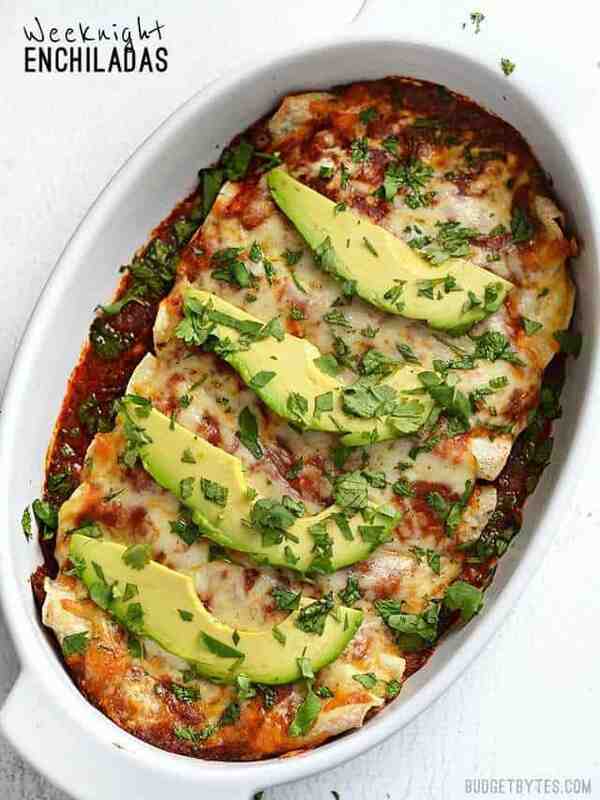 I want to make this for a new mom – would you bake it to completion and then give it to her or put the enchiladas in the dish and let her bake it when she’s ready? I’ll include a whole avocado and not slice it so it doesn’t turn brown.